During pregnancy many couples long for protection and support, which they can find in the ecumenical services of blessing. 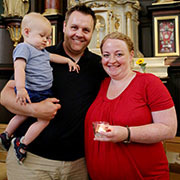 Ecumenical services are held four times a year for expectant parents in Essen under the heading “A blessing for new life”. They provide encouragement and support at a time which is often marked by mixed emotions. 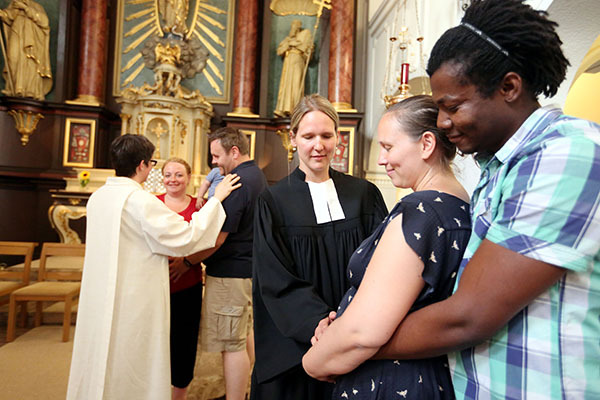 Many expectant parents come to blessing ceremonies. “I am happy. I am relieved. I am nervous. I am scared stiff”, is what the Berlin journalist Okka Rohd wrote about her pregnancy in a popular blog. It was also a central sentence in the short sermon given by Protestant minister Eva Gabra at the evening service of blessing held for expectant parents in Essen. It took place in the stylishly renovated hospital church at the Catholic St Elisabeth Hospital on the Ruhrallee. Jaqueline Bree with husband Jens Lübbe and son Jannes. It was precisely for that reason that they had come: pregnant women, expectant fathers, brothers and sisters, future grandparents, godparents and a number of children. Around 30 people had made their way to the church on this warm summer evening. “Through the blessing that you receive here, you are building a special relationship with your child, that would otherwise not be so possible, said Jacqueline Bree, while her son James was playing on the floor at the feet of his parents and grandparents. The couple had also taken part in a service of blessing in early 2016 during the pregnancy with him. “It is simply so good to know oneself to be so protected, together with the child and our whole family“, is how the 31-year-old Catholic teacher described her experience. She is now working as a volunteer with the service of blessing for newborn babies, started in 2017 – an additional format in this series of ecumenical services marking the beginning of life. 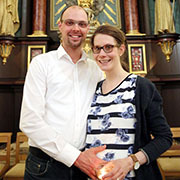 The project was devised and developed by the Protestant minister Juliane Gayk from Steele, together with her Catholic colleague, the pastoral adviser Astrid Joxen from Stoppenberg, and was offered first in Essen-Steele as a “service of blessing for expectant parents“. “God’s blessing is not hocus pocus!" A third format in the series came about with participation in the Babyworld 2017 event at the Essen Trade Fair Centre. Here there were a number of discussions about baptism, about questions of faith and about “blessings cookies” in the style of fortune cookies, but with a bible text in them. “Among many people we found there was a great longing to be supported and protected. That is what we wanted to offer within the framework of our service of blessing”, said Juliane Gayk as she explained the concept. 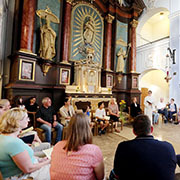 “God’s blessing is not hocus pocus, but is available for each and every one.” For this reason she hoped that the financing and the provision of staff for this innovative project would improve and that it would become more widespread across the whole regional church level as a network. Protestant minister Eva Gabra and her Catholic colleague, the pastoral advisor Astrid Joxen. 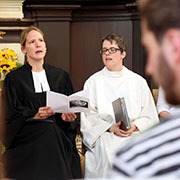 Katharina and Martin Fütterer felt that the sermon particularly spoke to them. They both found their first pregnancy to be “a real time of uncertainty and emotional tension” and said “So it is good to be able to come and receive a blessing”. They are expecting twins in September and want them delivered at St Elisabeth’s. Other, like the bi-national couple Lena and Emmanuel, who is from Ghana, have come to the service of blessing for a second time – their first child is now 15 months old. “It is good for the baby to have this special protection, and that is why we have come again“, said Emmanuel, with his arms around his wife and his hands laid protectively on her belly. She described how the candle in a little glass that they received the last time is still standing there in their home. From this evening there will be two candles.